The Lester Patrick Trophy was presented by the New York Rangers in 1966 to honour the late Lester Patrick. Patrick was a longtime general manager and coach of the Rangers, whose teams finished out of the playoffs only once in his first 16 years with the club. 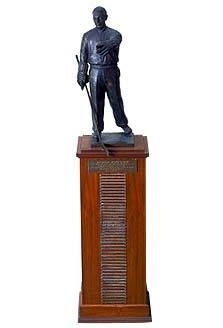 The trophy is an annual award presented for outstanding service to hockey in the United States. Eligible recipients are players, officials, coaches, executives, and referees. The winner is selected by an award committee consisting of the President of the NHL, an NHL Governor, a representative of the New York Rangers, a member of the Hockey Hall of Fame Builder's section, a member of the Hockey Hall of Fame Player's section, a member of the U. S. Hockey Hall of Fame, a member of the NHL Broadcasters' Association and a member of the Professional Hockey Writers' Association. Except for the League President, each member is rotated annually. The winner(s) receive a miniature of the trophy. 1974 Weston W. Adams Sr.